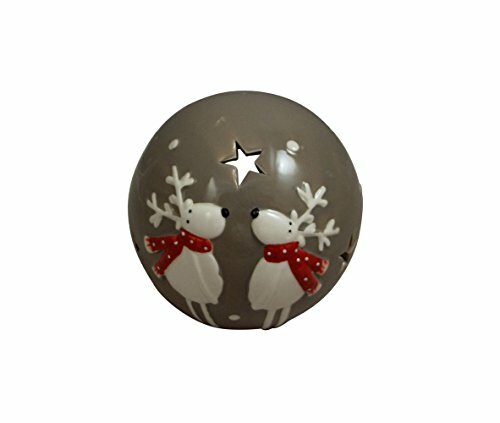 Grey Ceramic Reindeer Tealight Holder This stylish festive tealight holder will look wonderful adorning your fireplace or Christmas table. Finished in a lovely grey ceramic dome holder to hold a tealight candle. Finished in wonderful detail. A beautiful Christmas accessory to light up your home. If you have any questions about this product by Giftware Trading, contact us by completing and submitting the form below. If you are looking for a specif part number, please include it with your message. Diva At Home Set of 6 Red Glittered Christmas Poinsettia Votive Candle Holder 12"
Diva At Home Set of 6 Silver Glittered Christmas Poinsettia Votive Candle Holders 12"